Australia 2nd Inn 4/263 d.
Australia’s bid for an Ashes whitewash is over but they escaped with a draw in the fourth Test at the MCG thanks to yet another Steve Smith century. The fourth Ashes Test at the MCG looks destined for a draw, but England will still be fighting to secure an unlikely victory on an extended final day. Join The Roar for live scores and coverage from 10am (AEDT). England found themselves in a strong position heading into Day 4, leading the match by 164 runs with one wicket left in their first innings. While they didn’t add to that lead before James Anderson gloved a ball to Cameron Bancroft at short leg on the first ball of the day, it was still thought they were well ahead of the match. Getting rid of Cameron Bancroft and Usman Khawaja was positive as well, with there even being a thought that they could have had the game over and done with by the end of the day. 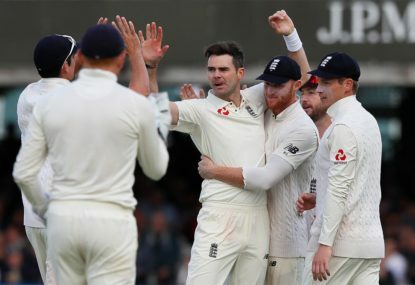 They will be ruing their decision to not declare on Day 3 though, as well as some negative bowling attacks which allowed Steve Smith and David Warner to grind the English bowlers down until an early stumps were called thanks to rain. When stumps were called, Australia sat 2 for 103, behind by 61 runs, with the partnership between captain and vice-captain reading 38 from 136 balls – a run rate of just 1.67 runs per over. It became clear as the day drew on that Australia were not playing for a result, and rather trying to grind England out of the game noting there were going to be overs lost, but England were their own worst enemy. The four-man pace attack of James Anderson, Stuart Broad, Tom Curran and Chris Woakes set baffling tactics with captain Joe Root. They stacked the offside field and bowled well wide of the pegs, allowing Smith and Warner to leave, leave and leave again. When it became evident the pair weren’t going to go chasing wide ones, England’s tactics needed to change, but they didn’t, which has left Australia in a position without a great deal of stress. While they are still behind and 98 overs is a lot of cricket, they would think eight wickets will be enough for them to bat the majority of the day and build up some kind of lead. If England’s tactics don’t change first thing this morning with an intent to take wicket, you’d have to start questioning what they are playing for, given they gain nothing from a draw. The good news is that there is no rain expected for Day 5 in Melbourne after we lost 43 overs yesterday. This match is headed for a draw. It would take an almighty collapse for Australia to lose from here, even with 98 overs on the cards. With David Warner in the midst of his most patient ever knock, Steve Smith still at the crease and eight wickets in hand, it’s just difficult to see where England firstly take those wickets and then have enough time to score the remaining runs. The Ashes to stay 3-0 leaving Melbourne. Be sure to join The Roar for live coverage of the final day’s play in Melbourne from 10am (AEDT) and don’t forget to add a comment below.